Glenn Cunningham is the Chair of the firm's Intellectual Property Practice Group. Glenn represents publicly traded and privately held companies in intellectual property and technology cases throughout the United States. Glenn’s trial practice includes the prosecution and defense of unfair competition, non-competition agreement, trade secret, trademark, patent and copyright cases. Glenn is the former Chair of the firm's Business Litigation Practice Group. He was a Lecturer in Law at the University of Connecticut School of Law teaching Trial Advocacy for nearly a decade. 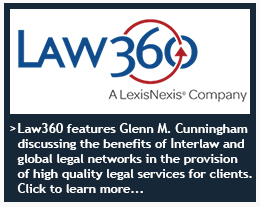 Glenn is currently a member of the Board of Directors for the Connecticut Technology Council, and was recently appointed to serve as Chair of the Board of Directors of Interlaw. Represented world-wide manufacturer of specialty cases in a federal action against former distributor alleging copyright, trade dress and trademark infringement. Obtained a temporary and permanent injunction and a judgment of over $1,000,000 against defendants who misappropriated and attempted to sell a valuable downline list.